Happy Easter! I hope today finds you blessed in the company of family and friends. Cheops will be our sleuth this year looking for those special 'treats'. Are your baskets opened yet? I have an Easter card to share with you. 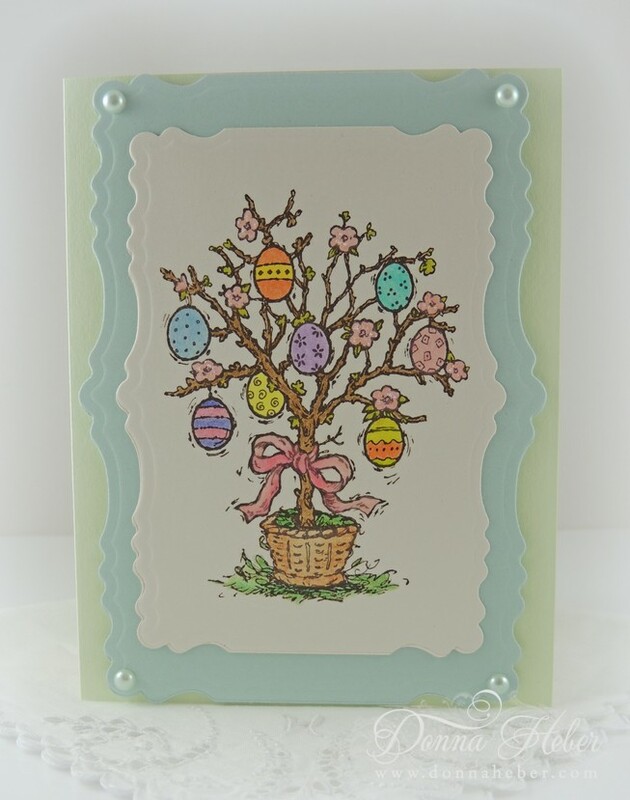 I used the Easter Tree stamp by Serendipity Stamps. It has been in my stash since last year. The image was stamped in StazOn Timber Brown on a Spellbinders Labels Twenty-Nine #5 die and colored with Prismacolor pencils. I added a little sparkle to the blossoms with a clear Spica pen. Crystal Effects was added to the bow for some dimension. The focal image was then layered onto a piece of Soft Sky paper also cut from a Labels Twenty-Nine die. The corners were accented with pearls. 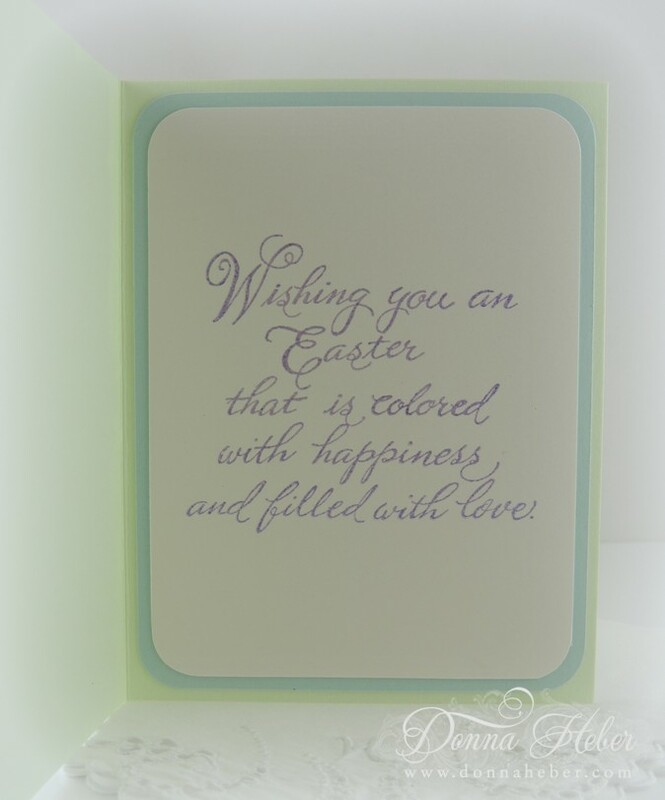 The inside sentiment was stamped in Lavender Lace and embossed with clear embossing powder. I thought the tree and saying went well together even though they are by different manufacturers. Everything was mounted to a spring green card. Pretty pastels to celebrate the occasion! I was tempted to add some ribbon and doodads to the front, but held back and decided to keep things simple. Blessings to you on this glorious Easter. You have made such a sweet and wonderful card. What a beautiful Easter card. Love the colors, so soft. 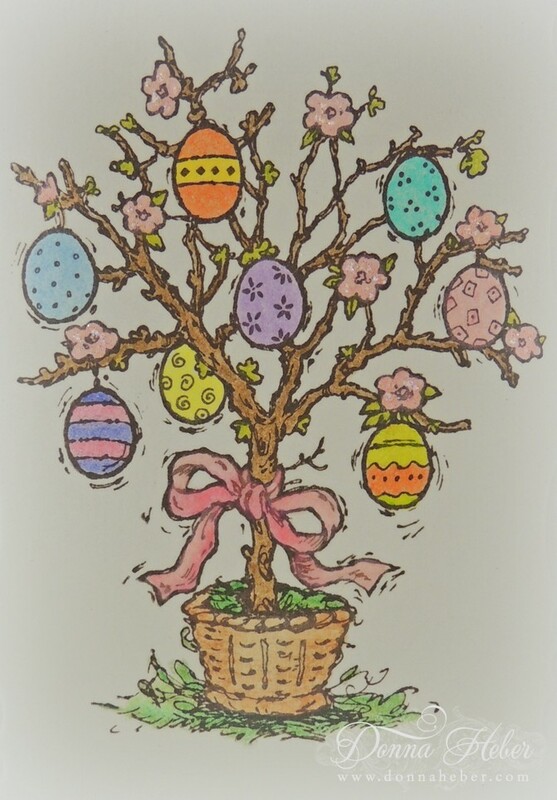 I love the Easter Tree! Wonderful post! 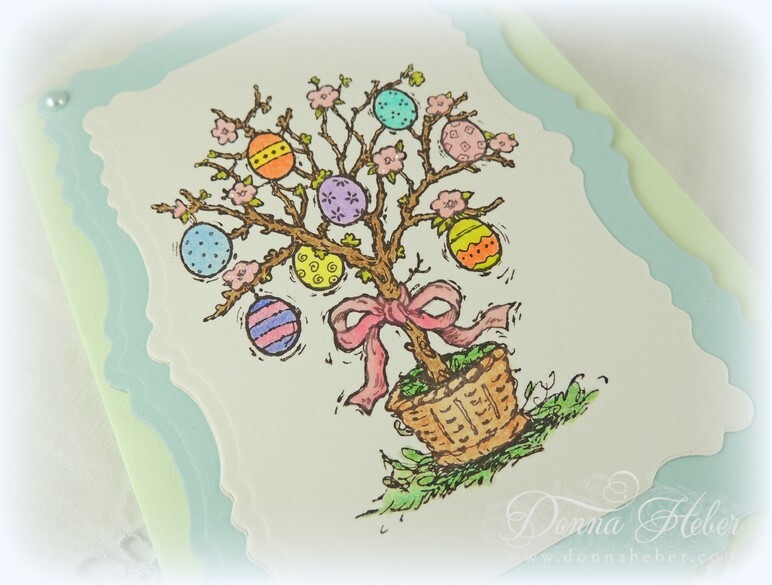 Happy Easter Donna, love this tree and beautiful card. Oh this is lovely Donna! Thanks for sharing. I adore the sentiment and have been looking for something with more umph than just Happy Easter. Pretty eggs! I love Easter. We dyed eggs, had an egg hunt and I hosted 14 people for a nice ham lunch. Awesome!